If you recognize this document you may be a constitutionalist. This week’s cover story dives into the conflict between Sheriff Ozzie Knezovich and right-wingers like Rep. Matt Shea. In particular, Knezovich’s frustration centers on a cell phone video a woman recorded while interviewing deputies about a Mine-Resistant Ambush Protected (MRAP) vehicle parked outside a Walmart. Asked if the vehicle would be turned against citizens, one deputy immediately says “constitutionally, they can’t…” before being interrupted. But that’s not what people focused on. That particular word, “constitutionalist,” became the focal point, with guys like Rep. Matt Shea seizing upon the remarks to condemn the Sheriff. It’s a definition that is so broad as to encompass almost anyone that supports anything like the American system of government. In that sense, yes, a constitutionalist could be considered anyone who advocates the defense and protection of the American Constitution. But that would include everyone from the ACLU to the NRA. The tricky thing about words is that they can have multiple meanings. Old meanings can change and new ones can be created. These days, “Democrat” doesn’t just mean someone in support of democracy, and Republican doesn’t just mean a person in favor of Republic. Words take on connotations because of the way people use them. Constitutionalist, as a specific ideology, is a phrase that both violent and non-violent anti-government types have used to identify themselves for decades. Locally, the label was used by people who refused to follow orders from law enforcement, often up in Stevens County. There’s this accountant who refused to answer questions about tax returns called himself a constitutionalist back in 1995. And this former Stevens County Commissioner who refused to answer questions about his car tabs, citing the Third Amendment, called himself a constitutionalist, too. Here, in 1984, is a story in the Spokane Chronicle about a Colville police officer fired because his constitutionalist views allegedly affected his “ability to enforce the city ordinances and statutes.” The police officer shows up in later stories about constitutionalist groups as well. And here’s a Spokesman story, three years later, about a Bonner County man who was arrested for driving without a license and for drug possession. He refused to be fingerprinted or photographed. That same year, a self-described constitutionalist from Endicott man was arrested, claiming drivers licenses were unconstitutional. Here’s an article from 2001, about an “Okanagon County constitutionalist” who had refused to shut down his unlicensed radio stations and allegedly tried to run over a U.S. marshal. Here’s a 1996 piece about an Idaho constitutionalist group who argued that Idaho’s governmental officials were illegally holding office because they hadn’t said, “so help me God" when being sworn in. In his 1995 book, Ruby Ridge, Jess Walter uses the word in multiple passages to describe the milieu of anti-government types that surrounded Randy Weaver up in Boundary County, and showed up during the court hearings. In other words, the use of the word “constitutionalist” has often meant something other than simply people who advocate following the Constitution. It’s not unlikely that a longtime law enforcement officer might have heard of anti-government types calling themselves “constitutionalists,” and have concerns about the sort of weapons they carry. To some, McVeigh remains a hero. I also reached out to experts on militia and anti-government groups to understand how they use the word. Mark Potok, senior fellow with the hate-watch Southern Poverty Law Center group, says he typically tries to avoid using the term “constitutionalist.” But he takes a stab at defining it. Some focus on the 10th Amendment, he says. Others argue that the 14th Amendment was never officially approved or that the federal income tax was never legally authorized. 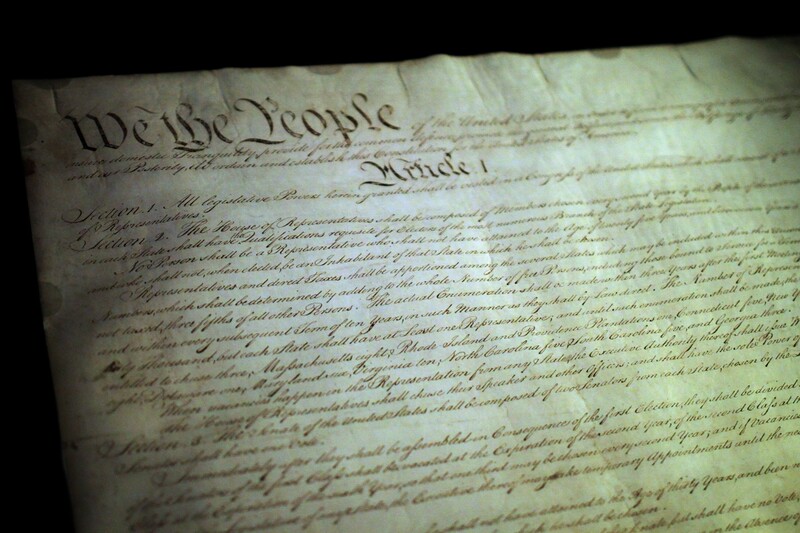 “Candidly, many of them are wildly wrong about the content” of the Constitution, Potok says. Robert Churchill, a militia movement scholar with the University of Hartford, is fairly critical of the Southern Poverty Law Center, believing the group often fails to distinguish between the wide variety of belief systems that make up right-wing groups. But he uses the word constitutionalist too, in his taxonomy of the the militia movement. He divides militias into a civic-minded “constitutionalist” wing — and an end-of-days focused “millenarian” wing. The constitutionalists had a “fairly sophisticated understanding” of the constitutional arrangements and details. The millenarians were the type obsessed with conspiracies around the New World Order, the Bilderberg Group, and the Trilateral Commission. Traditionally, the millenarians had more influence in the Northwest, he said, while constitutionalists were stronger in the Midwest. Amy Cooter, a sociologist at Vanderbilt University who also studies militias, defines constitutionalists as “groups who take a literal interpretation of the Constitution” instead of seeing it as a “living document” in the way the Supreme Court has. (They often consider Supreme Court rulings to be unconstitutional.) In particular, she says, they may have a strict views of the Second and First Amendments. Typically, she says, the groups you may have to worry about are the ones who are conspiracy-oriented, isolated, and religious — not the ones who talk about the Constitution on Facebook. “In general, the more that local law enforcement could leave these people alone, the better off everybody is,” Cooter says. Spokane sheriff: police militarization a "myth"